I live on the pseudo main line. I’m lucky to have a Trader Joe’s very nearby, but aside from that, I can’t stand any of the grocery stores around. I hate Super Fresh, it creeps me out. The Genuardi’s isn’t terrible, but it doesn’t do it for me either. The Acme is too tiny and Whole Foods, you know, I can’t afford to shop there. I love Giant, but there isn’t one close enough to me. This is why I’m jealous of people who live near Wegmans. Everyone raves about it, but I’d never been. Why? Because they’re so damn far away. I made R go on a roadtrip to Wegmans last Sunday, just for kicks. We went to the Downingtown one, because really, they’re all equally far. What did I think? It was big. Too big. I was overwhelmed. The aisles are nice and wide. And really, certain things really are cheap. I was surprised. The produce and meats and seafoods looked amazingly fresh. It was pretty deserted when we were there, and it’s probably annoying when there’s tons of people around. But if I had a Wegmans more near me, I would certainly shop there. Sigh. Then we were hungry, so we drove around and around for somewhere to eat. And since we were in Downingtown, it was chain restaurant city. And what’s with the ended up at Bonefish Grill. I’d never heard of it before, so to me, it was new and exciting, even if it was a chain. Scary thing? R had never been to one either, but just by seeing the little fish log, she knew what restaurant it was. Yes ladies and gents, she is the official queen of chain restaurants! It’s not a casual restaurant, so it’s a bit on the swankier side, but not snooty. 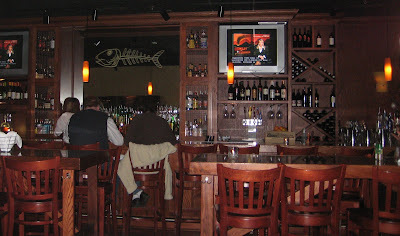 While every other restaurant seemed deserted, there was actually lots of people there that night. We were both surprised. The servers all wear chef’s jackets. It was weird. And our server was so stiff and rehearsed. I felt a little bad for him. 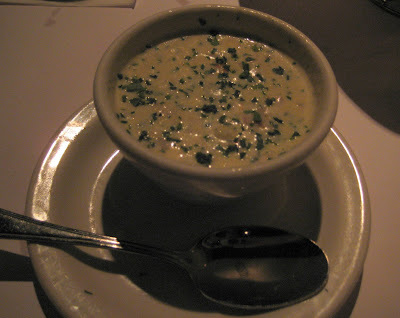 They only have one soup – corn chowder with crab. I am a chowder hound, so I had to try it. It was surprisingly good. And it had nice huge hunks of crab in it. R got the fontina chop. 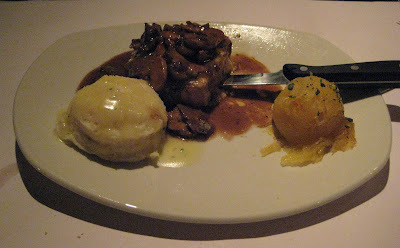 It was a good sized pork chop with mushroom sauce. R doesn’t like mushrooms, but she ate around them, and finished off the chop. She got the garlic mash as a side, and the veggie of the day was a butternut squash. 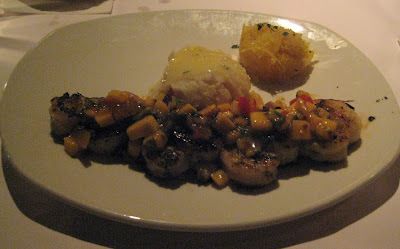 I got the scallops and shrimp with mango salsa. It was also surprisingly good. I also got the garlic mash, and while good, it wasn’t garlicky at all. The squash was alright, nothing great. All in all, a decent meal. Not too pricey, and the service was good. Will I be back? I guess if I only had chain restaurant to pick from, probably. And for a chain, that’s pretty much a reigning endorsement from me.